Faith's life is in turmoil. An onslaught of emotions erupts from the sudden appearance of apparitions that have her reliving tragedies from her past. Her optimism and confidence have been shaken. It's not the Faith we're used to seeing and somehow needs to overcome these self-doubts. Lost friends and family are haunting Faith, as issue eight resumes the terror from the previous issue. She can't function at work with the guilt weighing her down so she bears down at home. Normally, Faith is the model of self-confidence and resiliency, but these ghosts and her memories have unnerved her. 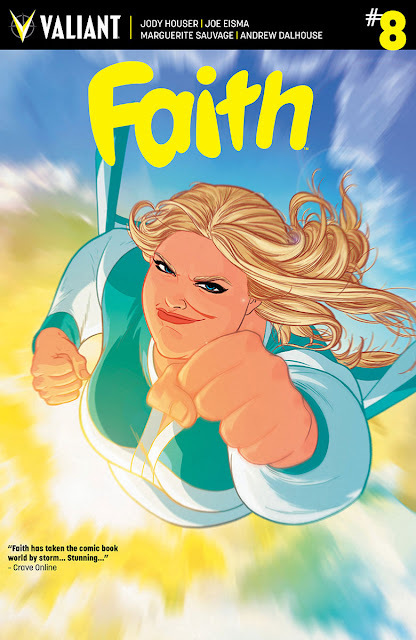 Jody Houser continues to delve deep into what makes Faith, Faith. It's a character study that is rare for a superhero book. She makes her relatable and human even though she's a psiot capable of extraordinary things. The turmoil within her mind is more devasting than any villain she could encounter. Faith has been through a lot, carrying the pain and guilt but powering through with her sense of duty and optimism. Now, wallowing with insecurity she seeks out the help of a friend. A different voice that aids in giving her an opposing perspective. The dynamic of this is a good lesson in getting help for whatever you're going through. Houser gives some added development to supporting characters as well. It all leads to a surprising reveal of who or what was the source of her trouble. Artists Joe Eisma and Andrew Dalhouse keep doing a brilliant job in design and layouts. Eisma's attention to detail and conveyance of emotion with his stellar pencil work and Dalhouse's colors are irresistibly inviting despite the gloomy circumstances. Marguerite Sauvage’s fantasy sequences are as beautiful as ever. 'Faith' is one of the best comics for various reasons but Houser's commitment to making Faith a complicated but relatable human with powers might be the best reason. If you're not emotionally invested in her as a person then you've missed the point. Faith represents the best of us but also exposes our very human weaknesses. If she can triumph over her mental roadblocks then so can we. What could be more powerful or inspirational in a hero? Be your own hero.